The newest line of IP cameras from Bosch hit the market this month, in the form of the FLEXIDOME IP 4000 and IP 5000 cameras. These new cameras offer the latest technology in image quality, data storage and management, access and control, and ease of installation. Learn more about these new IP cameras from Bosch, in our blog. The newest line of IP cameras from Bosch hit the market this month. The IP 4000 offers 720p HD resolution for superior image quality, and the 5000 offers IR (infrared) vision for use at night. The 5000 also features 5 megapixel resolution, Automatic Varifocal (AVF) and integrated infrared illumination. All models in the new Flexidome line also feature Intelligent Dynamic Noise Reduction and Intelligent Defog built in. IDNR reduces bitrates to reduce storage costs and strain on the network, which at the same time ensuring that image quality is not compromised. Defog improves the image quality in low contrast scenes such as fog. 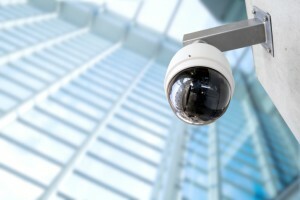 Flexidome IP cameras offer a number of solutions for data storage. Cloud storage, network video recorders, and built-in SD cards (in some cameras) can be used to store video data safely and efficiently. Users can access this data using free viewing clients and apps available for mobile and desktop devices. Users can utilize Bosch’s free viewing clients along with Dynamic Transcoding technology to get remote access anytime and from any place to not only live video streams, but still images, recordings, and even camera controls. Dynamic Transcoding is used to adjust the bitrate to suit the available bandwidth on the network, which ensures ideal video streaming and pausing. A DIVAR IP recording solution or VIDEOJET XTC from Bosch is required to fully utilize Dynamic Transcoding. The Flexidome IP cameras integrate with software and recording solutions from Bosch and other security vendors, due to their Open Network Video Interface Form (ONVIF) conformance. All Flexidome cameras feature the same Graphical User Interface, making installation and setup much easier. This entry was posted on Thursday, July 23rd, 2015 at 1:24 pm. Both comments and pings are currently closed.